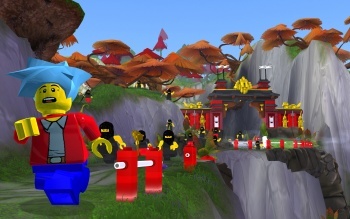 The world of Lego comes to life in NetDevil's brick-based MMOG. Lego and MMOGs are like the peanut butter and chocolate of this industry. They're both wildly popular and potentially profitable, so it makes sense that some smart developer would find a way to combine them together. The trick, of course, is in finding a way of putting them together in a way that seems like more than just a cheap attempt to cash in on their popularity. Fortunately, the gang at NetDevil has created a context that does justice to the brand without compromising the gameplay. The first challenge in creating a comprehensive Lego MMOG is in bringing all the various settings under one roof. To that end, NetDevil has created a story about four explorers seeking out the source of Pure Imagination. Unfortunately, they find it, screw it up and pretty much ruin everything. Their actions unleash the Maelstrom, a chaotic force that blows up planets, spreads anarchy, and basically makes a mess of the universe. Now all the various Lego settings rely on the newly created Nexus Force to combat the chaos. As a side note, NetDevil doesn't have access to the third-party licenses for things like Harry Potter or Star Wars, but it hasn't ruled out including them in the game if clearances can be obtained. Lego Universe includes lots of directed content that's drawn from the Lego sets, but we've been more interested in the freeform building options. Each player will have their own personal planet they can build on with the Lego bricks and pre-built components they've collected, won, or purchased. So if you want to build a pirate ship, or an Old West fort, or a medieval castle, all you need is a little imagination and a lot of bricks. A wide range of filters will help you easily sort through the bricks and find just the right one you want at any particular moment. The creativity you show as a player is part of the effort required to clear the Maelstrom from the universe and reassert the power of imagination. Since NetDevil wants to keep the brand kid-friendly and can't commit the staff required for immediate approvals of public content, it's including a friend system. You'll only be able to visit the planets of your friends, so you won't be exposed to forts that are shaped like genitalia. Unless, of course, you happen to have friends like mine in which case you'll be spending a lot of time dreaming of your escape from the planets Wang and Rod in the Johnson System. While crafting your own unique environments is attractive enough, Lego Universe also allows creators to attach scripts to objects in their world. The process uses a graphical programming language (much like that in Lego's programmable sets), so players can drag and drop behaviors and conditions onto any of their creations. You could, for example, put a knock-knock joke or a password on doors. More interestingly, you can manage the interactions between objects and actors. We saw one example where the designers created some Lego chickens and attached movement and state changes to them when they heard the words "Release the hounds." Now, whenever any player (or any other object) says, "Release the hounds," the chickens will activate a certain behavior. When you begin chaining those behaviors together and having them react to the behaviors of other actors, you can create some elaborate situations. Unfortunately, the team isn't sure that players will be able to attach states to other players, so the capacity for using this system to create certain types of gameplay isn't as great as it might be. Still, given all the creativity that's contained in the package, Lego Universe looks to make great use of the Lego brand.